The three reliefs of Adam and Eve constitute one of the most unusual and important early purchases by the South Kensington Museum, the forerunner of the V&A. They formed part of a block acquisition of 89 pieces of sculpture and majolica. These came from two collections assembled by Ottavio Gigli and Giovan Pietro Campana during the period 1825-50. 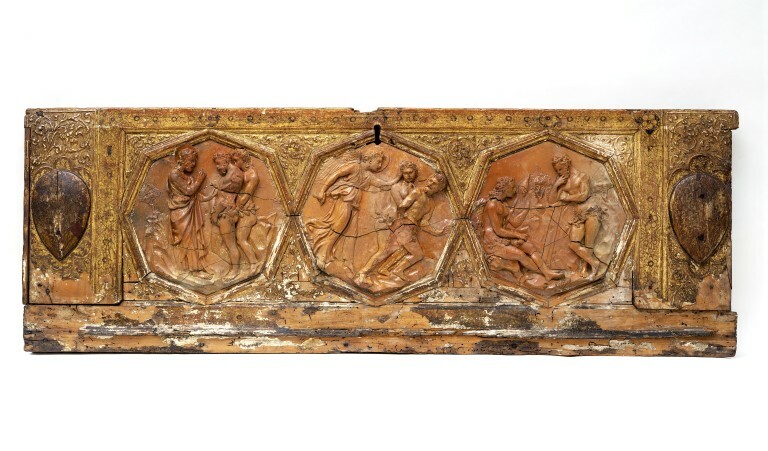 These three reliefs are related to another of the Creation of Eve, which is now in the Museo dell'Opera del Duomo, Florence. We think that they are the only surviving pieces of a series concerning the Old Testament story of Adam and Eve. The complete set may have numbered six, if there were also panels of the Creation of Adam and the Temptation. Three octagonal terracotta reliefs mounted on the front of a wooden chest. The orange-brown reliefs depict: The Condemnation of Adam & Eve, the Expulsion from Paradise and the Labours of Adam and Eve. The wooden surround has been decorated with gesso and gilt and there are traces of coats of arms on shields at either end. 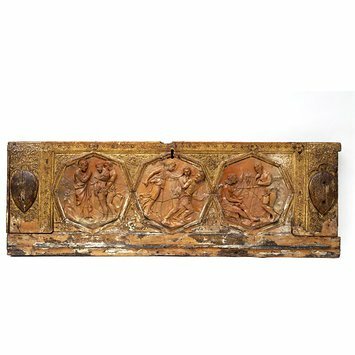 Chest front, wood and terracotta relief, depicting scences from Genesis, by the workshop of Lorenzo Ghiberti, Italy, ca. 1415. This fragment from a marriage chest incorporates small-scale terracotta reliefs. They represent a type of sculpture developed by Ghiberti while working on the first of his famous sets of bronze doors for the Florentine Baptistery. The reliefs show scenes of the Fall of Man. Marriage chests often depicted stories from the Bible or classical literature but they were usually painted not sculpted.